A COASTAL trough and associated low produced showers and thunderstorms, with moderate to heavy falls along the east coast of Australia, while a monsoon trough and embedded tropical systems generated moderate falls across northern Australia. Past seven days: In the first part of the week, surface troughs extended from the north and inland west of Western Australia, across central parts of the Northern Territory, and from north-west to south-east Queensland. Showers and thunderstorms produced moderate falls in parts of the Kimberley, Pilbara and Gascoyne in Western Australia, the Gulf Country, Cape York Peninsula, and across central to south-east Queensland. As the troughs deepened over the north and east, further moderate falls were recorded in the western Kimberley, the north-west of the Northern Territory and parts of Cape York Peninsula. An upper level trough combined with the surface trough in the east, and generated moderate falls, with locally heavy falls in areas of central and south-east Queensland, and also around the Greater Sydney region. A weak cold front crossed Tasmania and generated light falls in the west of the atate. From the middle of the week, a monsoon trough to the north of Australia triggered thunderstorm activity in the Kimberley, the Top End of the Northern Territory, and northern Queensland. A series of upper level troughs persisted over central and southern Queensland, and combined with the surface trough extending through inland Queensland and New South Wales, while a trough and associated low pressure system formed near the east coast. These features produced widespread showers with embedded thunderstorms, and produced moderate falls to the end of the week across much of eastern Queensland, north-eastern and east coast New South Wales, and far eastern Victoria; locally heavier falls were reported in some parts. An inland trough produced thunderstorms with moderate falls over the goldfields in Western Australia. In the last part of the week, an embedded tropical low on the monsoon trough in the Coral Sea tracked towards the eastern Cape York Peninsula and quickly intensified into tropical cyclone Trevor, with moderate falls reported on the southern flank of the system. Trevor made landfall on the afternoon of 19 March, just south of Lockhart River as a category 3 system. A tropical low developed to the northwest of the Kimberley coast within the monsoon trough at the end of week, which produced showers and storms, with moderate falls reported in the Kimberley. 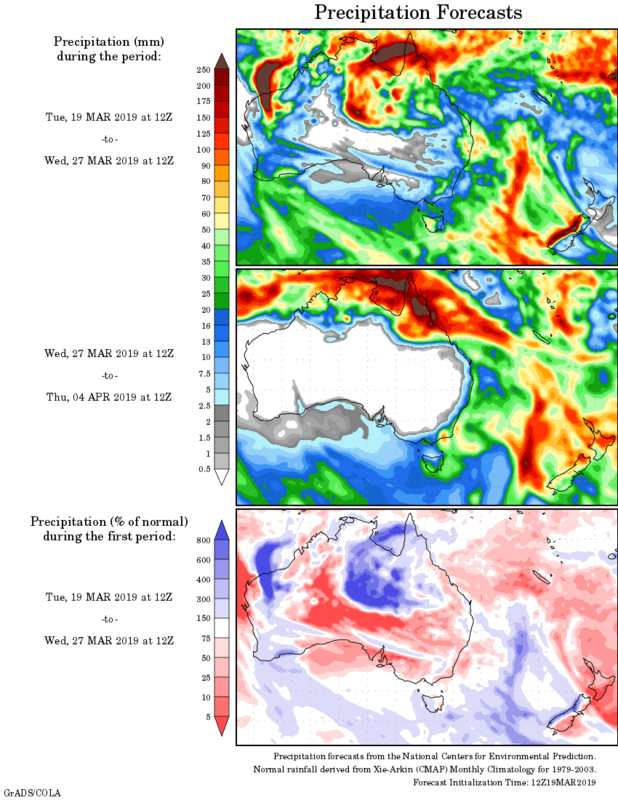 A surface trough extended from the Pilbara and along the west coast of Western Australia, and produced moderate falls in the Pilbara, eastern Gascoyne and towards the southern coast of Western Australia. Rainfall totals in excess of 100 mm were recorded in coastal parts of the Kimberley and Gascoyne in Western Australia, small areas of Cape York Peninsula, central and south-east Queensland, and parts of the central coast of New South Wales. Isolated totals in excess of 200mm were recorded around Greater Sydney and the Gold and Sunshine Coasts, including the highest weekly rainfall total of 306 mm at the Gold Coast Seaway in Queensland. Rainfall totals in excess of 50 mm were recorded in spots of the Kimberley and Pilbara coast in Western Australia, small areas of the north-western and northern Top End in the Northern Territory, much of western Cape York Peninsula, through parts of central and south-east Queensland, and from the central to south-east coast of New South Wales. Rainfall totals between 10 mm and 50 mm were recorded in parts of western and northern Western Australia, much of the Top End in the Northern Territory, the Gulf Country, northern and eastern Queensland, north-eastern and eastern New South Wales, a small area of eastern Victoria and very small patch of western Tasmania. Little or no rainfall was recorded in remaining parts of Western Australia; South Australia; the southern half of the Northern Territory; the south-western quarter of Queensland; central to western New South Wales; Victoria away from the far east, and most of Tasmania.